Guarana is used for weight loss to enhance athletic performance, as a stimulant, and to reduce mental and physical fatigue. It is a frequent addition to energy and weightloss products. Some people also use guarana to treat low blood and chronic fatigue syndrome (CFS), and to prevent dysentery. It is also used to enhance sexual desire, to increase urine flow, and as an astringent. Product is suitable for raw food diets. Product is shipped into carton drums to preserve humidity and protect from the sun. 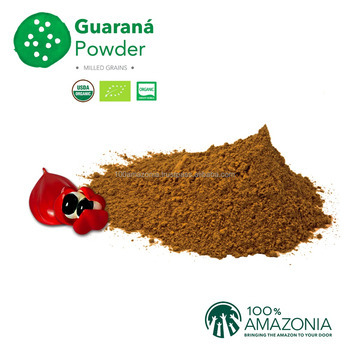 Guarana powder is made by partially sun-drying then roasting at low temperature and milling fresh organic guarana seeds. 100% Amazonia is an export-driven company specialized in developing premium ingredients from the Amazon rainforest to the health, cosmetic, natural and food industry across the world. 100% Amazonia operates since 2009 and already exports to 28 different countries worldwide. 100% Amazonia works together with local cooperatives to harvest and collect the fruits directly from the rainforest. Further local joint-ventures have been established with the best production plants across the Amazon to serve high demanding market in North-America, Asia and Europe. The main products are purees, powders, pulps, butters and oil products made from fruits such as açai, cupuaçu, bacuri, passion fruit, buriti, muru muru and andiroba. Minimal processing is applied to maintain pure products with high nutritional values.